The undergraduate program of the Fischell Department of Bioengineering at the University of Maryland, College Park is founded in biology, driven by human health issues, and emphasizes innovation. Our objective is to merge the principles and applications embedded in engineering with the sciences of biology, medicine, and health. Bioengineering is a field rooted in physics, mathematics, chemistry, biology, and the life sciences. Each of these areas is applied in a systematic, quantitative, and integrative way to approach problems important in biology, biosystems, medical research, and clinical practice. Bioengineering advances fundamental concepts, creates knowledge from the molecular to organ to system levels, and develops innovative processes for the prevention, diagnosis, and treatment of disease. In short, bioengineering seeks to improve the health and life of humankind on many levels. Bioengineers specialize in those products and processes made from, used with, or applied to biological organisms. In addition to engineering science and design, bioengineers study cell biology, physiology, bioinformatics, bioimaging, and biomechanics. The synthesis of engineering and biology gives bioengineers unique capabilities in our modern world. Bioengineering programs are often broad in scope, covering a variety of biological topics that are investigated with engineering principles. Biomedical engineering programs tend to emphasize topics related directly to human health, and thus may be seen as a subset of bioengineering. Brian Lipford, Partner and VP of Strategic Initiatives, Key Technologies Inc.: "Product Development"
What will I learn if I major in bioengineering? The undergraduate program is designed as a comprehensive, broad-based bioengineering education with opportunities to specialize. Moreover, our program emphasizes not only knowing how to apply engineering concepts to biological systems, but also developing a fundamental understanding of the biology. This knowledge is achieved through an immersion in biological science courses; foundation-building in math, physics, chemistry, and the engineering sciences; and the learned application of engineering principles to biomedical as well as general biological systems. 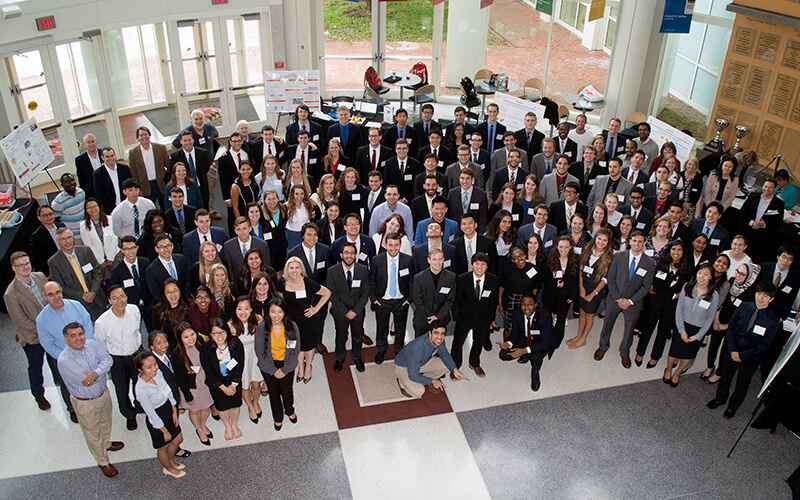 The program culminates in the year-long senior Capstone Design course, which focuses on experiential learning as students collaborate with physicians and scientists to design engineering solutions to real-world clinical problems. What kinds of design projects do undergraduates work on in their senior year? All Clark School undergraduate programs require students to complete a final project in what is known as a Capstone course. In Capstone, teams of students, under the guidance of faculty and mentors, utilize what they have learned throughout their undergraduate studies to create their own engineering designs from concept to product. The Fischell Department of Bioengineering receives support for its Capstone Design competition from the Fischell family, the Mpowering the State initiative, and industrial sponsors AgNovos; Becton, Dickinson and Company; and General Electric. Additionally, Capstone students often receive mentorship support from clinicians and/or industry representatives. Examples of our seniors' Capstone research are available online. All students in our major have the opportunity to participate in research in state-of-the-art bioengineering labs on campus, either within the department or through special programs. These include the Bioengineering Honors program, an intensive two year, thesis-based departmental research program; the HHMI Undergraduate Research Fellowship, a prestigious award that supports high quality basic science research; the ASPIRE Program, in which students collaborate with faculty and staff on technology-driven design and development projects; and the Maryland Center for Undergraduate Research, which assists students in finding research opportunities. A team of bioengineering and chemical and biomolecular engineering undergraduates earned the top prize in the 2017 National Institutes of Health (NIH) Design by Biomedical Undergraduate Teams (DEBUT) challenge for their efforts to develop low-cost tools to assist in the diagnosis of Alzheimer’s disease before patients show symptoms. Rising senior Adam Berger was awarded a Barry M. Goldwater Scholarship and Excellence in Education Foundation. Berger is interested in creating novel lab-on-a-chip biosensors that enable point-of-care disease detection and diagnosis. Senior Jeff Rappaport, won a 2012-2013 Howard Hughes Medical Institute (HHMI) undergraduate research fellowship to support his continued research on safe and effective targeted drug delivery systems. "SEEDS Fellowship Supports Sikorski's Work on Blood Clotting Gel"
Sophomore Michael Sikorski received a 2012-2013 National Science Foundation-funded fellowship that supports his research on blood clotting hydrogels, which he conducts in the Functional Macromolecular Laboratory. "Spinning Engineered Silk Into Tiny Designs—With A Microscope"
If someone says they use a microscope in their research, most people would assume it's because they need to observe something very small. Senior Sara Johnson, a member of Joonil Seog's research group, used one grow and weave threads of silk-elastin-like peptide polymers (SELPs) into specific patterns and shapes. The Fischell Department of Bioengineering has also established relationships with biomedical research centers within the University System of Maryland and at surrounding government or industrial locations. Partner institutions and agencies includethe National Institutes of Health (NIH), the National Institute of Standards and Technology (NIST), the Food and Drug Administration (FDA), the Environmental Protection Agency (EPA), Children’s National Medical Center, and the University of Maryland Baltimore (UMB) Schools of Medicine, Dentistry, and Pharmacy. Our undergraduate students learn from regulatory experts through collaborative research with FDA scientists and engineers located only 5 miles from campus. Many federal laboratories (EPA, USDA, and NASA) are also nearby and offer internships for our students. Additionally, students have the opportunity to work in labs at UMB (Schools of Pharmacy, Dentistry, and Medicine)and gain exposure to clinical practice. Students can get involved through their professors' collaborations or through the Engineering Co-op and Career Services office. What kinds of jobs can I get with a B.S. in bioengineering? Thanks to the breadth of our program, Maryland graduates are presented with a full range of career opportunities from those in medicine, human health, foods, government, dentistry, law, pharmaceuticals, biotechnology, ecological/bioenvironmental engineering, biomedical devices, bioprocessing, and teaching, just to name a few. Our students also benefit from the Clark School's Engineering Career Services, which gives students 24-hour access to engineering co-op, internship, summer, post-graduation, and part-time job listings. It also runs free resume clinics, career fairs, and other workshops for job seekers! Visit them online at www.eng.umd.edu/careers to learn more. The Fischell Department of Bioengineering at is a forward thinking academic organization dedicated to utilizing engineering and scientific knowledge and methods to assist the citizens of Maryland and the nation. The Department intends to develop biologically based knowledge and products to promote ecological, human, and animal health, and to improve the quality of life while maintaining a healthy environment. The Department aims to quickly assume a leadership role in the field of bioengineering through educating an innovative student body and pioneering groundbreaking technologies. The undergraduate program in the Fischell Department of Bioengineering provides students with a broad and fundamental education relating engineering with the biological sciences. The program has focuses in biomedical devices, human health, biotechnology, and ecosystems. These focuses all contain components of fundamental sciences, design, and communications skills. The students' educational achievements all contribute to enabling a wide range of career paths after graduation. Produce graduates with a foundation in professional ethics who will actively seek to positively impact their profession, community, and society. Maryland bioengineers gain a broad-based education in which engineering approaches are used to understand and improve living systems and their environments. We educate students to excel in the field of bioengineering and carry out research, development, and commercialization of bioscience systems and tools that will improve the lives of people throughout the world. The specific Student Outcomes detailed by the Bioengineering Program are detailed below. The Fischell Department of Bioengineering at the University of Maryland offers an undergraduate program in bioengineering which is accredited by the Engineering Accreditation Commission of ABET. For more information, see www.abet.org.